Google, Youtube and the BBC are among the corporate clients that helped London venue LSO St Luke's, grow its occupancy levels for the year ended July 2011. The venue’s occupancy rose by seven percentage points to 85% in the period, also boosted by bookings from L’Oreal, Wella, the British Film Institute and the Association of International Broadcasting. 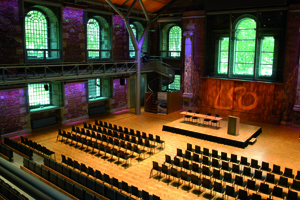 LSO St Luke’s sales and events manager Victoria Steinitz said: "We believe the reasons for our success include membership of the Unique Venues London and London City Selection groups, as well as the use of a PR agency. We have also expanded the venue’s capacity." The venue’s event spaces include the Jerwood Hall, which has capacity for 450 people, and three breakout rooms.